I’d chat with friends in rosy rooms. and snuggle into frilly frocks. that’d flow like sunshine’s golden hue. where perfumed dreams would cast their spell. my buzz would set emotions free. Put the buzz in your hive . . . precious prairie people. or . . . did you mean ‘beelightful’? Thanks for visiting, Trini. Hi Kelly, It makes me happy to think I could have such influence. I appreciate your visit. My hollyhocks are towering over 6 foot tall this year! I love to stand amongst them and feel their lovely energy. Thanks for stopping by. Beautiful photos, Julie. 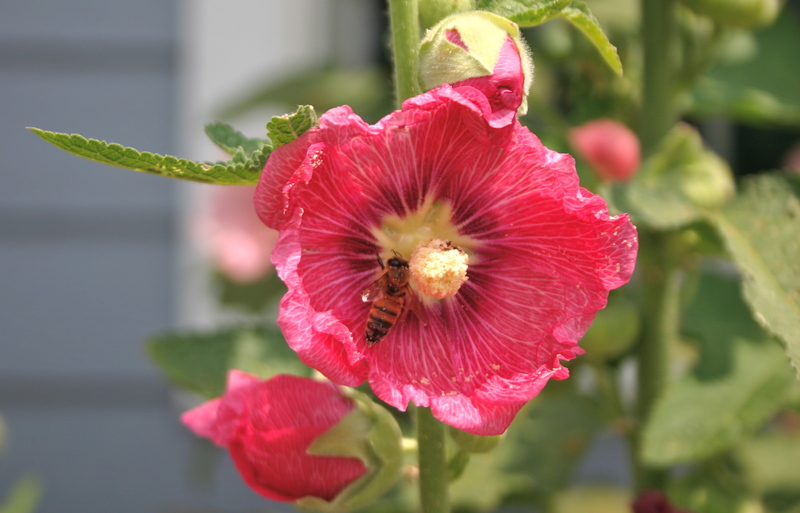 I love the one where the bee is speckled with pollen. What wonderful little creatures. Another of nature’s marvels. Hi Diana, Yes, I love that pollen speckled bee as well. I didn’t realize until I looked closely how much pollen these little creatures actually carry around. Thanks for the nice comment. Perfectly done! Your garden and bees are amazing as are your words. A true compliment from a gifted artist such as you. Beautiful! I love these sweet honey buzz images, Wow!!! Very nice! I couldn’t find the like button either. Hi Ann, Thanks for visiting and leaving a nice comment. I experimentally ditched my like button in an attempt to change my focus. Thanks for noticing. Love looking at this through your eyes and lens. “Polka-dotted pollen duds” Love it. You have a way of making light of life. Round of applause. I felt like i was inside of a dr.seuss book. Your rhyming and pics were impeccable. That’s just about the nicest compliment anyone has ever left. Thanks so much and nice to meet you. Thank you, it was nice to meet you too.